The nose is full and balanced, reminiscent of dark caramel, with some piney hop aroma and a subtle rum character. Rich, it starts with a substantial suggesting a sticky mouthfeel. The resiny hops sneak in quietly, with a dried fruit aroma lingering on the finish. It’s been a while… seems like we always say that. Well tonight, we are drinking TWO beers! I feel bad that we haven’t been drinking that much. But hey, my travel season is over and we are going to hit 2012 running… or stumbling, depending on how many beers we drink before the new year! 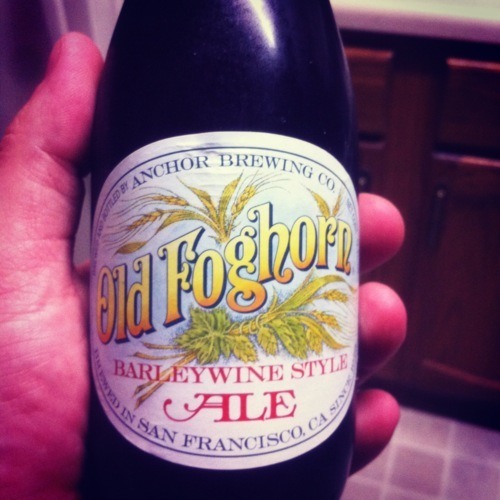 Tonight we are sipping on a beer from Anchor Steam. I LOVE pretty much every beer they make. I have even been to the brewery. Maybe that’s why I like them so much. Anyway, I am starting to find a new appreciation for barleywine too. I wasn’t aware that Anchor Steam even did a barleywine. Let’s give it a shot! In the Glass: In the glass, it looks like a typical barleywine. It’s thick, with little head, and has a deep dark amber color. I am pretty sure EVERY single barleywine I have had looks the same in the glass. Must just be something about the style. Nose: The nose starts off like any barleywine… then you are hit with the hops. I didn’t expect those to jump out like they did, but the hops made a big difference in my thoughts on this beer before the first sip. I’m a big IPA guy, so when hops get thrown into the mix, watch out! Flavor: At first, it’s smooth and has a very subtle barleywine flavor. But then… THEN it hits you. Holy cow, where did that come from? We drank this beer right out of the fridge, and I know it would open up as it sits there. But man, what a punch in the throat (literally) when you swallow this bad boy. Maybe they should change the name to “Bad Boy Barleywine”. Mouthfeel: In the mouth, it’s barely there. You don’t feel it until the beer is pretty much gone. The front of the tongue gets nothing, while the back of the tongue, after you swallow, is hit with the hop character. For a beer that is supposed to be thick (like most barleywines are), I expected more from this one. But hey, the taste is what counts. Aftertaste: There isn’t much of an aftertaste here. That, for a barleywine, surprises me. There is a BIG ABV, coming in just shy of 9%, but you would never know it. What aftertaste there is reminds me of a good double IPA. The beer is really good. Most barleywines leave you with that “I can’t stand to drink too much of this”, but this one doesn’t. It’s not filling, and the subtle aftertaste makes it a refreshing change from the norm. I really like it. Anchor Steam, you have done it again! Bottoms up people. Ricky asked me to pick out a beer for us to review tonight, so I decided to pick out one that I had seen in the store the other day and almost bought. I ended up not buying it, then later we realized that we actually had it at home to do as a 1001 Bottles beer. So tonight, since it sounded good the other day, we are going to review it. The beer is a barleywine, and I love barleywines, so I’m expecting great things. This beer sounds like it will be one I will like a lot. In the glass, it pours out about how you would expect a barleywine too. It has some head that is a white, foamy color and the thickness really depends on how you pour it. The beer itself is a thick reddish-brown color, not too dark. It kind of looks like apple cider. My beer has only been sitting in the glass for a few minutes, but I can’t really get much of an aroma out of it. It really only smells wet, with maybe a hint of spice to it. Let’s see what it tastes like. First taste, and it tastes… well, as expected, like a barleywine. Rich taste, spicy, and full of flavor. These are just yummy beers. You really feel the flavor as it flows over your tongue, and it leaves a hint of spice in the aftertaste. Not really hoppy, like an IPA, but just spicy and full of a lot of flavor. This is definitely a beer I would buy again and again.